As you can see, the least damage is done by people in Africa, South Asia, and Latin America. But these places also happen to be the poorest places: Because they don’t have much industry, they don’t churn out much CO2. The below plot shows the correlation between poverty and green-ness. As you can see, each dollar of a rich person is attached to a smaller carbon cost than the dollar of a poor person. This is partially because rich people get most of their manufacturing done by poor people, but also because rich people are more environmentally conscious. …and highest in the industrializing economies of Asia. Kudos to Brazilian output for being so green, despite the country’s middle-income status. Were these statistics to factor in the CO2 absorption from rainforests, Brazil and other equatorial countries would appear even greener. 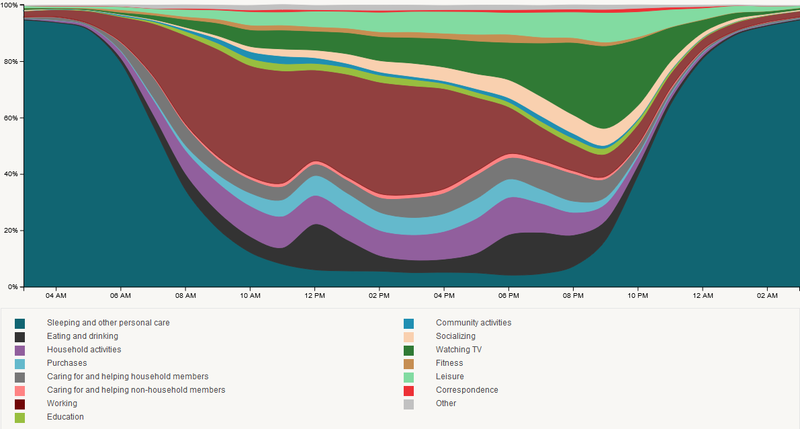 Data from the Word Bank. Graphics produced on R.
QS’s top 10 from 2008 to 2013; The label is the 2013 rank. Columbia is included because it was in the top 10 of 2008 and 2010. MIT (#1 in 2013) has shot up in the rankings. This is in line with the increasing demand for technical and computer science education. At Harvard, enrollment into the college’s introductory computer science course went up, from around 300 students in 2008 to almost 800 students in 2013! 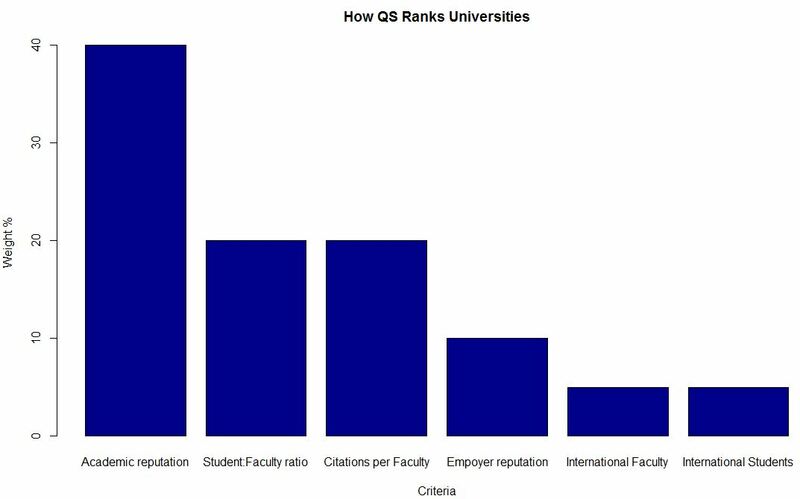 Note that many of the universities are apart by tiny numbers (MIT, Harvard, Cambridge, UCL, Imperial are all within 1.3 points of each other), which increases the likelihood of bias or error influencing the ranking. In any case, it appears futile to try and compare massive multi-disciplinary institutions by a single statistic. 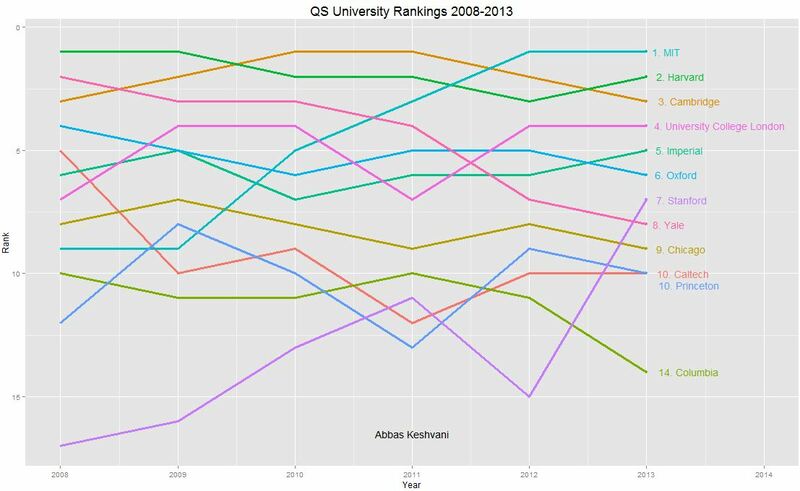 However, larger trends – like MIT’s and Stanford’s ascendancy – are noteworthy. Data from QS Ranking. Graphics produced on R.